I was out enjoying Mammoth Cave National Park when the news of Neil Armstrong’s death broke this weekend. By the time we wandered back into 3G range, my fb and twitter feeds were dense with links, photographs, re-posts, and memorials. My first reaction was on the petty side of life. When my partner asked how old Armstrong was (82), I instantly calculated how many years longer he had lived than my dad. After that, I calculated how much longer he had lived than my closest friend’s dad. I’ve been told this “how unfair is it that this guy lived so much longer than my dead parent?” reaction is typical, but I guess “typical” and “astronaut” aren’t two words that should occur in the same sentence. My second reaction was to consider how members of different generations would respond to the news. In terms of age, I represent the big break—my earliest memory is of the first lunar landing, or more properly, watching the news broadcast from my dad’s lap. Americans older than I am are likely to have their own memories of Apollo 11, but people younger than I am will experience those memories as reflections, directed toward them by their parents or older siblings, books or movies. My third reaction was to wonder how my students would react to the news. As I’ve mentioned before, the majority of them believe the lunar landing was a hoax. If the first man to walk on the moon dies, but you believe he’s been lying for past twenty-five years, are you going to roll your eyes? Or are you going to take another look at the evidence and perhaps re-evaluate your position? As I was hiking from Echo River Spring up to Mammoth Dome Sink on Sunday morning, I tried to decide if any of these reactions was blog-worthy (no). Did I even need to write about Neil Armstrong’s death? By the time I got back to the Internet, Google was returning 3875 news articles on the subject. 95% of my fb friends had written about it. Twitter was a long, repetitive scroll of re-tweets. I didn’t think there was much more to be said about it, really. TYSON: But I think, for me, what matters there, is he’s an American icon because he embodied all of our dreams of what it is to explore. And since we haven’t been back to the moon in 40 years, for me, part of me died with him, because the dream hasn’t been sustained. And that worries me, greatly, about the future of us as a space-faring nation. INSKEEP: Was his accomplishment, then, a dead end? TYSON: It has been, and if we’re not back out of low Earth orbit for another 20 years, it makes me wonder whether it’ll ever happen again. So it’s a sad moment, because the future did not become real for his achievement. I know it’s bad form to contradict Neil deGrasse Tyson, but…here goes. Tyson seems to be arguing that the purpose of the Apollo program was to cultivate future manned space programs. Manned space exploration didn’t flourish after Apollo; therefore, the American dream of space exploration has failed and we haven’t reached the “real” future. But surely the gathering of knowledge about the universe is not a linear or predictable process. There must have been hundreds—thousands—of possible trajectories for the development of science programs and knowledge-gathering missions after Apollo. We’ve followed some of those trajectories to their farthest points, developed some astonishing unmanned spacecraft and released them into the wild, and yet we’ve failed because we haven’t sent a human back to the moon or beyond a low-orbit space station. Stardust: collected particles from Comet Wild 2 and returned them to Earth! 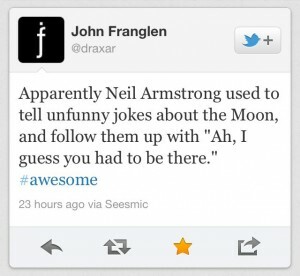 I’m not trying to downplay the accomplishments of Neil Armstrong or any other astronaut. I understand that Tyson is paying homage to one of the most courageous people to walk the earth, not to mention the moon. At the same time, I think Tyson is restricting us to a very limited definition of “explore.” The things we’ve learned through unmanned space exploration aren’t negligible and as MSL Curiosity has demonstrated, we haven’t lost our desire to reach new worlds. We’re just using a different tool set to make that happen. I think that’s a very astronaut thing to do—if one approach doesn’t work, we’ll try another. 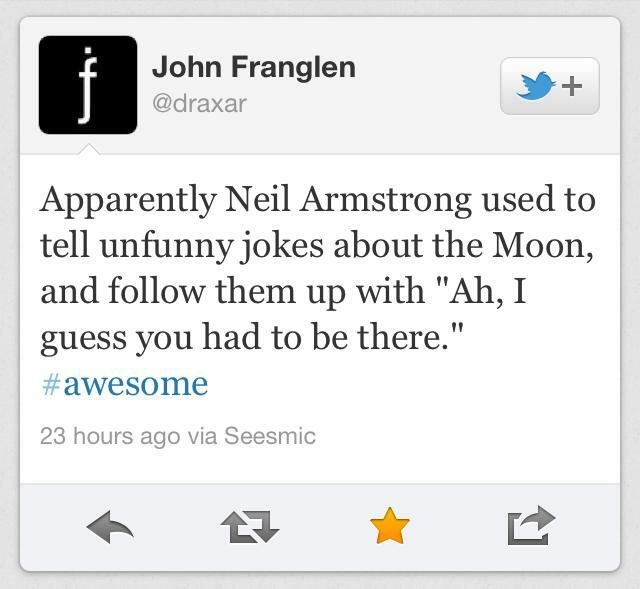 That’s how Neil Armstrong got to the moon and how Curiosity got to Mars. We can mourn the death of Neil Armstrong, but I think the lament for the American dream of exploration is a bit premature.